The Justice Society Returns in – Wait. What? 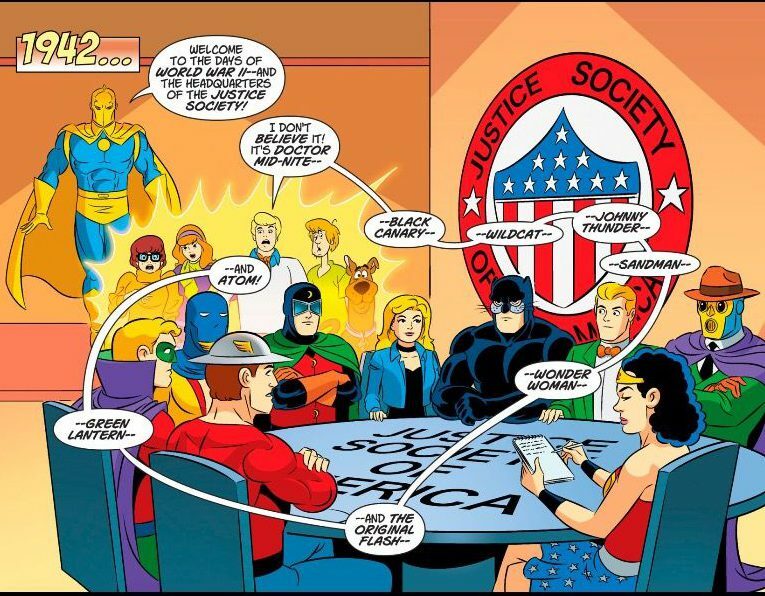 In action again, finally, the Justice Society of America. How many years has it been since DC gave us an original Justice Society of America story? The team was blanked out of existence with the dreary New 52 relaunch in 2011. DC’s Rebirth in 2016 has welcomed and played with the notion of the multiverse, and gave us back the first and best Flash, Jay Garrick, if only for a moment. “Doomsday Clock,” the miniseries written by Geoff Johns, seems prepped to give us the team back, if we can ever get down to the last tick. So imagine the surprise when a DC book hit the stands this week with the JSA in all their glory on the cover. Yet here we are – and this all-ages tale starring Scooby and the gang is relentlessly charming. 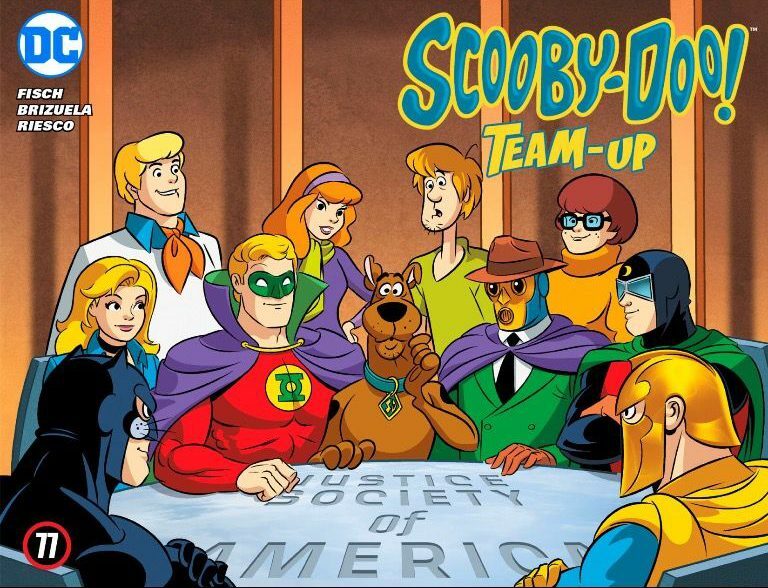 In “Victory Through Scare Power,” in “Scooby-Doo Team-Up” No. 38, cover date August 2018, written by Sholly Fisch and illustrated by Dario Brizuela, Pandora’s box is opened at the Lincoln Memorial and several ghostly demons burst out, determined to destroy the Washington Monument. Why? Maybe because they have something against phallic architecture. Anyway, Doctor Fate appears and tells the gang the only way they can learn how to defeat the malevolent spirits is to travel back in time to their first appearance – in 1942. 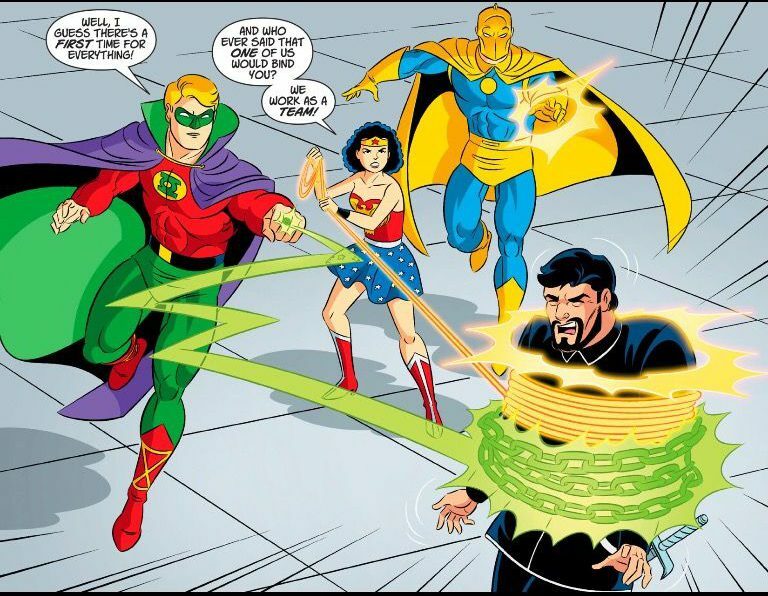 And he zaps Fred and the gang right back into the JSA headquarters, where Wonder Woman, Sandman, the Flash, Black Canary, the Atom, Dr. Midnite, Wildcat and Johnny Thunder are meeting. Sandman thinks Fate has brought the latest members of the Junior Justice Society. Zoink! Vandal Savage interrupts, opening Pandora’s Box, unleashing the spirits of destruction and warning that they are working with Nazis to destroy several key locations. Don’t you miss the days when villains would inform the heroes of their plans? The Flash! Sandman! Scooby-Doo! Those meddlesome ghosts do not stand a chance. What to do? Split up into smaller teams to thwart the bad guys! How else do you handle a crisis? In a nod to all those classic Silver Age JLA/JSA team-ups, there are even roll calls for every chapter. Along the way there’s some funny commentary on the teams as the gang gets to know these legends. That good handwriting excuse is not going to cut it, Wildcat. 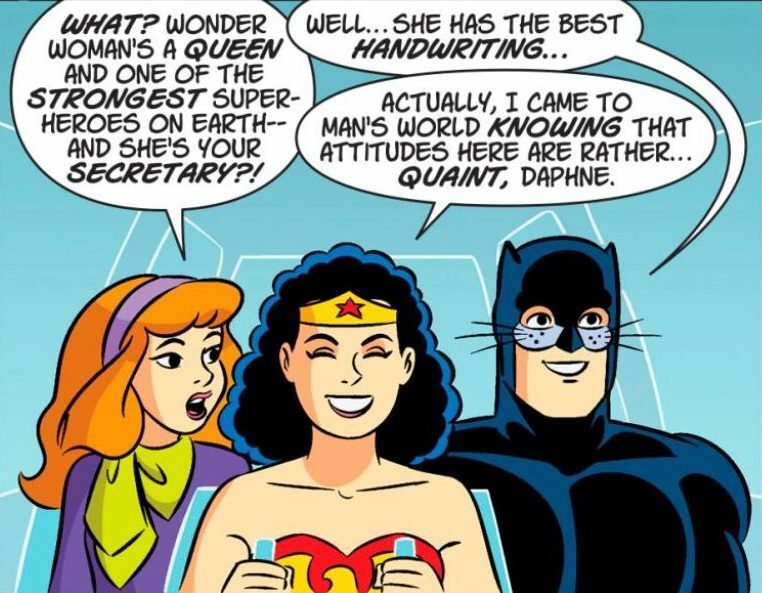 Daphne can’t believe Wonder Woman, one of the most powerful members, is the team secretary. Hippolyta – yes, this is John Byrne’s continuity, making this story all more DCU mainstream – smiles and tells her, “I came to man’s world knowing that attitudes here were rather … quaint, Daphne. There’s a cute postscript to that conversation at the end of the story that I won’t spoil. But the best surprise comes when Black Canary, Johnny Thunder and Shaggy find Rosie the Riveters gone Nazi at a shipyard – and Ma Hunkel, the original Red Tornado, joins the fray. The Red Tornado blasts some Nazi scum. Ma is so revved up to fight, she stays with the team for their big battle with Vandal Savage. He and his Nazi minions don’t stand a chance, and the kids learn enough to stuff the demons back in Pandora’s box in their own time. Fisch displays affection for the first and greatest super-team. Brizuela’s work might remind you of the lightness of Mike Parobeck. You can find “Scooby-Doo! Team-Up” in your local comic book shop and the DC Comics app. This story isn’t canon. Maybe it should be. And the World Shall Call Them – Substitutes! That does indeed look like a lovely Mike Parobeck style story. I’d glossed over this title in the solicits as I’ve never been a fan of Scooby and the gang so thanks for the review and screen shots; I might even pick this up digitally just to get the original JSA back for a little while. Cool to find out about this one. I bought the issue where Scooby and the gang met the Legion of Super-Heroes, and that was fun. I have to snag that one. The latest issue features a team-up with the Doom Patrol, and it looks great.